How can I reposition and/or resize my net_graph? Alex_fHow can I reposition and/or resize my net_graph? how can i change this thing's color ? 2SP00KY5M8how can i change this thing's color ? statsummary_embedded.res -> ClassBar1A, 1B, etc. [quote=2SP00KY5M8]how can i change this thing's color ? what am i supposed to edit to change the chat size? shinsowhat am i supposed to edit to change the chat size? how do i remove all hud elements besides the hit numbers and killfeed/killstreak icon? how can i change the size of the killstreak counter in the killfeed? 1- how can i fix the position of the icon ? Shupahhhow do i remove all hud elements besides the hit numbers and killfeed/killstreak icon? Which will get most things, and then do the same in whatever straggler file you find (like resource/ui/hudplayerhealth.res). Both are possible, but are very far from easy. For 1, you can change the bonuscross to be a solid material (the same as the bg, or a refract material if you want no bg), and have position that at the left/right of your hp bar, and then set it to scale so that when at 0 health it covers all of the hp bar. For 2, you can make the hp bar that gets covered by 1 use a complicated mess of custom fonts, that are block fonts but set up with the label width so that it only appears when health is 2 digits or whatever. You can do it more complicated with weirder custom block fonts that appear at arbitrary values, but going by digits is significantly easier. And though I've never done it myself, you could hypothetically pin_to_corner to the max health number with a special font (and set that to use auto wide to contents) to let you differentiate between different max health values and recreate percentages. Magnum hud does both in a way (except for #1 it is positioned upwards and scales towards the bottom, and for #2 it only cares about health values >100 and >50 and >10 and so on without dealing with percents), if you need a reference. Needless to say, it's probably much more work than it's worth. Iirc it uses the same font as the rest of the killfeed. To make it smaller you have to edit the TextFont used by HudDeathNotices in hudlayout.res, whether by just swapping it to use a smaller font or changing the font declaration in clientscheme.res. I can't remember if killfeed fonts overlapping icons is a size issue or a font kerning issue though. It might require either using a different font, or manually editing how the kerning on that font works, in order to solve. [url=https://huds.tf/forum/showthread.php?tid=266]Magnum hud[/url] does both in a way (except for #1 it is positioned upwards and scales towards the bottom, and for #2 it only cares about health values >100 and >50 and >10 and so on without dealing with percents), if you need a reference. JarateKingFor 1, you can change the bonuscross to be a solid material (the same as the bg, or a refract material if you want no bg), and have position that at the left/right of your hp bar, and then set it to scale so that when at 0 health it covers all of the hp bar. Hmm... that seems rough, indeed. So I'm assuming the HP bar is not one of the elements that can be rotated on it's side? That's a damn shame. Well anyways, thanks for your knowledge. resource/UI/HudItemEffectMeter_Action.res missing ContinuousProgressBar field "ItemEffectMeter"
where/how do i install them. You can find them in the resource\fonts. If you're on Windows, you can select them all, right click, and select Install. Anybody knows which file controls the new exp color in the matchmaking experience bar (the amount you just earned)? Both on the main menu and the post-match window. My hud does not show medigun names while someone is healing me, any way to add this in? 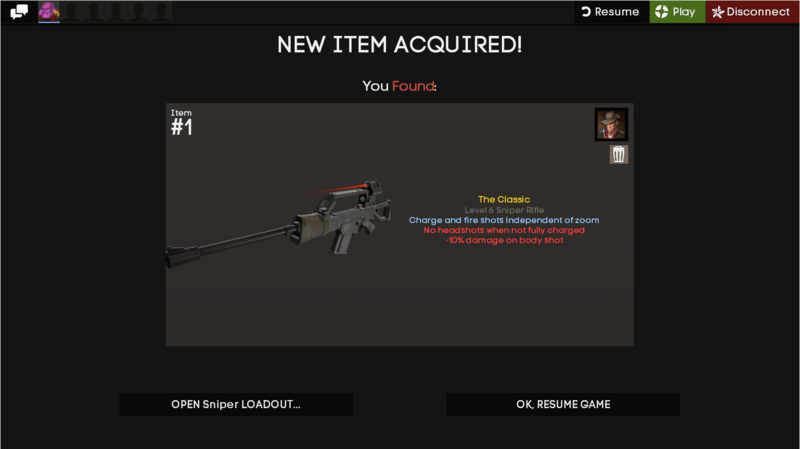 My HUD doesn't show the MvM Win Screen with the items each player receives after beating a full round of MvM. Which file is it located in? Thanks. My hud doesn't modify that file. Don't know why the win screen would be blank. Maybe it has something to do with mastercomfig? If configs can mess with hud elements, that might explain why I've witnessed various bugs with the hud. I'll play around with it. Can someone explain why the attacking robots at the top are clipping with the bar? I've eliminated all minmode positions in wavestatuspanel.res and hudmannvsmachinestatus.res but apparently there's a third file that controls both the position of the attacking robots as well as the size of the background box.